The Public House Taproom opened quietly on Saturday, February 2 in the Mammoth Premium Outlets on Main Street. The owner, Lienne Anderten-Smith, had not planned to open the bar on Saturday. Originally she wanted to open in July 2018, but “Murphy’s law was in full force during buildout,” she said. The opening was pushed to September, then November, then January, and when a town inspector finally gave Aderten-Smith the ‘all-clear’ on February 1, she opened up the next day. No pomp. No ribbon cutting. Just beer. “Then it was all hands on deck,” said Public House manager Delia Dykes. Dykes came from Denver to help run the Public House at the request of her “best good friend since three” Lienne Anderten-Smith. Anderten-Smith owns the Public House. She has also been “beertending” at June Lake Brewing [JLB] for the last 4 years. The bar occupies a cavernous 3,000+ square foot corner unit next to Black Velvet Coffee Roasters, in the space that was occupied by the Van Heusen store. The taproom has a long bar, a lounge area with couches, and an old TV with a Nintendo 64 plugged into it. Half of the wall space is made up of floor-to-ceiling windows. The other half is drywall. On the drywall hang sparse, vintage-style pictures of horses racing steeplechase and mustachioed men. Exposed ventilation pipes and steel girders dress out the ceiling. The style is industrial with some kitsch, though, not enough kitsch for Dykes. “We need more frames on the walls for people to dust,” she joked. 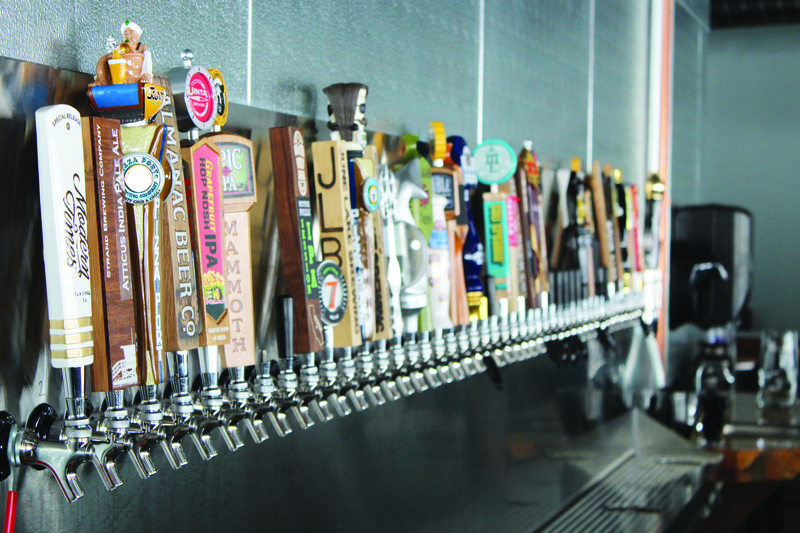 42 of Public House’s 50 taps are currently in use. They have 39 different beers, one cider, one white wine and one red. Dykes said that the Public House will emphasize local brews. “We currently have two from Mountain Rambler, three from JLB, and three from Mammoth Brewing,” Dykes said. The mascot of the bar is the “Bucci Cat,” (pronounced like “Gucci”) a dapper looking silhouette of a cat with a mustache and a monocle. The name came from Anderten-Smith’s child. “Her three-year-old just started calling people ‘bucci cats,’ and nobody knew where it came from,” Dykes said. For food, the Public House serves savory pies from an L.A. company called Fork-in Pies. The pies come in beef, chicken, or vegetable curry and are delicious, though small for the $11 price tag. You can also purchase a soft pretzel with mustard for $4. Dykes said that the bar hopes to expand its food options soon by adding sides for the pies and house-made cheese for the pretzels. Dykes also said that the bar hopes to expand its entertainment options. Along with the Nintendo, the bar has a projector mounted to the ceiling. “We don’t want to be a sports bar, but we can put the big games on the projector… I want to play old horror movies on it,” Dykes said. The Public house is also considering hosting live music, open mic poetry, and “Publican interpretive art,” according to Anderten-Smith. Dykes said she wants to get trivia and board games going in the bar as well.